Trump has spoken about “pivoting” to “acting” more presidential several times in response to reporter inquiries. Setting aside the absurdity that such questions need to be asked, he generally took the position that he would get around to it eventually and that it would be easy. That position is an admission that he is not currently acting presidential and that when he does so it would just be an act. rather than a genuine component of one’s character. There isn’t a single word in that tweet that is true. All of Warren’s public statements prior to Kaine’s selection indicate that she never considered herself to be a VP candidate. Following the Kaine announcement she responded directly to Trump with her own tweet saying that “I’m right where I want to be, @realDonaldTrump: Calling you out & holding you responsible for your reckless vision for America.” She has a close relationship Hillary Clinton who campaigned with her just last week. Trump assumes that everybody else harbors the same measure of hatred that he does. But no one has less insight into why Clinton chose Kaine than Donald Trump. First of all, Trump is ignoring the fact that ISIS has virtually endorsed his candidacy. And just as Clinton predicted, they are using him in their recruiting videos. But it’s his third grade level heckling that continues to prove that he is utterly incapable of even a hint of presidential bearing. The reason Clinton and Kaine don’t look presidential to him is that he doesn’t know the meaning of the word (literally). Trump has called his own GOP colleagues “losers, weaklings, liars, and pussies.” Even if he were to start behaving like a princess at high tea, it would just be another facade that he could abandon when he no longer needs to pretend. And if you aren’t convinced that this behavior is cause for concern, Just imagine how Trump would deal with Congress, citizen groups, and foreign heads of state. It would not be merely embarrassing, it would be dangerous. Drumpf is incapable of becoming more presidential as he hasn’t a clue what that means. He’s a sociopath and that’s a severe mental illness. His business life has allowed him to mask those deficiencies, but being president will not. He only portrays what he really is== sick. Keep him away from our White House. Trump is a fraud. Where are his tax returns? The media should do a total blackout of him, his tweets, and his whatever until those records are produced. We have a right to know that the man is not who he says he is, and that he pays nothing to the upkeep of this nation, does not support the military, and does not support public education in any way. So shun him, media. Make him play by SOME rules, at least. Donald J. “Loudmouth Bully — I’ve got a plan” Trump needs to disappear! When Donald J. “Loudmouth Bully — I have a plan” Trump gets into the White House, he’ll do more damage to the USA than can be repaired in several decades thereafter. Donald Trump is nothing more than an opportunistic blowhard. At the election that really counts, Donald J. “Loudmouth Bully — I’ve got a plan” Trump needs be voted into oblivion, never to be heard of again. Donald Trump doesn’t understand the first thing about politics and/or policy. Domestic or otherwise. The World according to Donald J. 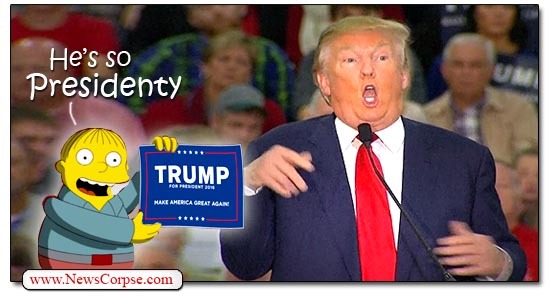 “Loudmouth Bully — I’ve got a plan” Trump…..
Donald Trump is nothing more than an aged version of a fourth grade playground bully who, when he’s not insulting people who disagree with him [and encouraging (his) security guards to rough them up], is speaking in broad generalizations, like a kid winging a book report for a book he hasn’t read. He believes in god — that is, God Trump. Most, if not all, money and/or wealth he acquired is as a result of the fact that no-one had the guts to stand up to his big mouth and tell him to go *&%# himself. Donald Trump doesn’t understand the first thing about today’s economics. Donald Trump is the epitome of the narcissistic sociopath whose only interest is in himself. Donald Trump is running for President because Donald Trump’s ego told him to and he is eating up the attention like candy. The moment he is contradicted he reverts to insults. Anyone who supports Donald Trump is a fool. ====>>> A dangerous fool! <<>YOU<<– the People" at all. The world is not going to bow down to him just because he demands them to. “Anyone who supports Donald Trump is a fool. ====>>>A dangerous fool<<>YOU<<– the People" at all. Donald Trump is making the USA the laughingstock of the world with his verbal hooliganism. Donald Trump is an international embarrassment! Donald Trump obviously believes that America isn’t great as he uses the slogan “Let’s make America great again”, thereby implying that America isn’t at the moment. ****YOU***** the People, at all.